CHANCELLOR Gordon Brown will today end his long bachelor years and wed long -time girlfriend Sarah Macaulay. The man who has made prudence his by-word has finally decided to throw caution to the wind amid amazing secrecy. But he finally came clean last night after the Record discovered the banns posted at his local registrar’s office. The couple will wed in a private ceremony in his Fife constituency before jetting off on honeymoon to Cape Cod. The wedding ends years of ill-informed speculation over their five-year relationship. Some London-based commentators had even suggested the relationship had hit the rocks and that 49-year-old Brown had decided to remain single. News of the wedding had been as closely guarded as details of one of the Dunfermline East MP’s Budgets. Only a tight circle of close friends and family were in on the secret. But the Chancellor had to admit defeat after we phoned him last night to tell him the cat was out of the bag. One Labour party sourcetold the Record they were amazed they managed to keep it quiet for so long. They said: “It just goes to show what a cloak and dagger operation it has been. It was confirmed last night that Prime Minister Tony Blair will not be a wedding guest. Arrangements remained a tightly guarded secret. But under Scottish law, the couple had to publish wedding details in the nearest register office to where the ceremony would take place. Details appeared on a single sheet of paper pinned to the front window of the register office. 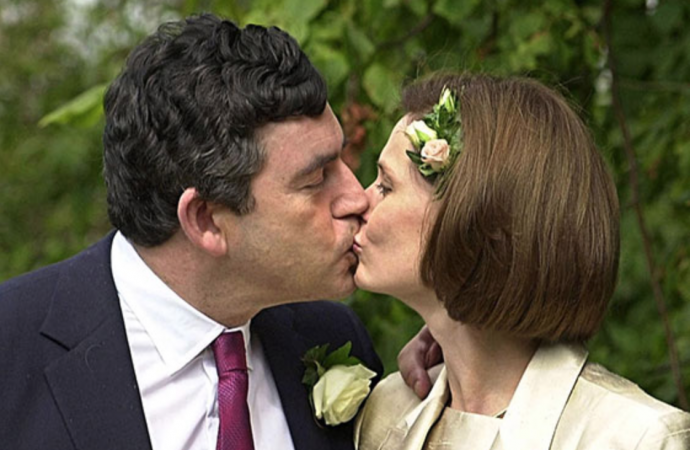 Under Section 4(2) of the Marriage Scotland Act 1977, the couple were obliged to allow the publication of their full names – James Gordon Brown and Sarah Jane Macaulay – along with the date of the wedding, August 3. The couple would have notified the registrar at least 15 days before the wedding. They will honeymoon in Cape Cod, Brown’s favourite holiday destination. The wedding will bring to an end years of conjecture about his love life. For years it seemed that he was destined to remain a batchelor and there were even mutterings among the chattering classes about his sexuality. In the past, he has been linked to Princess Margarita of Romania, advocate Marion Caldwell and TV presenter Sheena McDonald. He is believed to have popped the question to Sarah, 36, during a holiday in America in 1998. He was reported to have asked his father John, a retired Church of Scotland minister, to conduct his wedding ceremony, but his father died in December 1998. He always refused to commit himself to marriage. He has only allowed himself to admit that “marriage is important”, adding “I’m sure I’ll do it one day”. The wedding also puts him in a stronger position politically. His supporters had feared his single-status left him at a severe disadvantage, particularly compared to the family-friendly Blairs. The recent birth of Leo Blair was seen by some as a new set-back for his long -term ambitions. Downing Street watchers will also be quick to contrast Brown’s strenuous efforts to have a quiet wedding with the hoopla which surrounded Leo’s birth.